Here's the latest bit of insanity from Lethbridge. 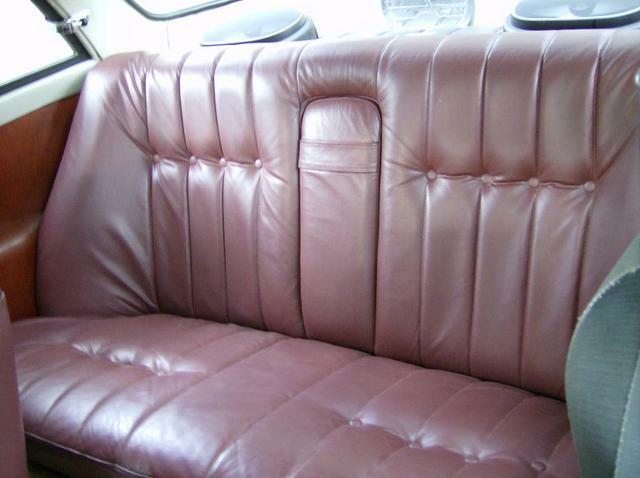 In the spring, Greg and I scored a mint leather interior from a 264 at the local PYP. 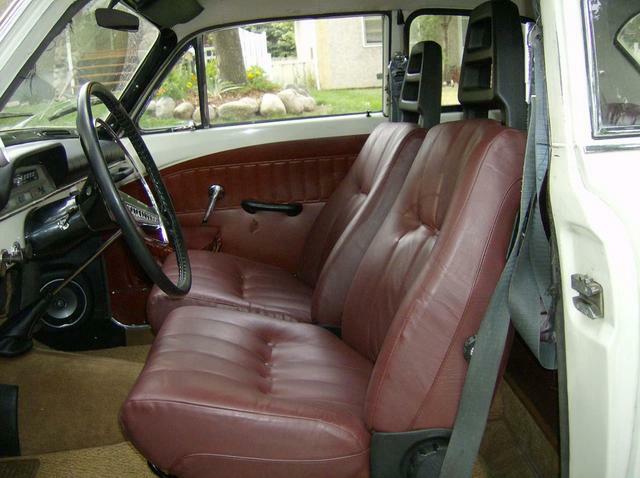 My old seats were junk and the leather was just too nice to pass up, or crush. The 4 door seats were not going to work all that well in the 2 door, but Dale was kind enough to donate a set of 242 front buckets to the project. The crazy thing is how well all this modern stuff fits into the little 122. The buckets go in with some small brackets to adapt the 240 rails to the 122 supports. 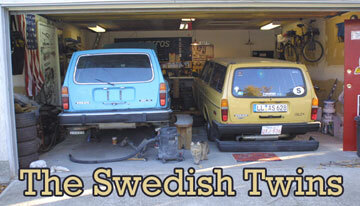 With the headrests off, the 122 and 240 seats are remarkably similar. The leather has been undergoing a leather treatment to soften it up prior to putting everything in and I'm also changing the colour to match the original interior...only those in the know will be able to tell that something is not quite right with the install. The leather treatment is a slow treatment, but it was starting to work, so I pulled apart the front buckets this weekend and put the leather covers on Dale's 242 seats...the foam is different so I had a little repair to do on the drivers bolster. The 264 seats were all foam, the 242 seats have metal bolsters. I'm guessing that the leateher seats were meant to be more plush and the 242 a little more sporting? They are more firm for sure. The back seat was the problem. The bottom fits, the back does not as it is 6 inches too long (man it's getting late...I never say these sorts of things ). So with some encouragement from Greg (AKA Bondo Master) I chopped 3" off each side of the top of the seat, then re-welded the wire frame back together...don't try this at home kids, foam burns as does leather! Then I re-attached everything with hog-rings and tucked the extra material in where I could. An inch of foam was added to the side bolster to take up some of the material slack. Here it is done. And installed...it fits perfectly and is very comfy. I also completed my tach upgrade. Now to dye the seats (dark red) and get some new door panels and the interior is done. It should be more like Greg (AKA Doesn't know how to put enough hardener in the Bondo guy). I still can't believe how well that bottom seat slotted in on the 122. It's totally meant to be there. Can't wait to see this interior all dyed and finished! I still can't believe how well that bottom seat slotted in on the 122. It's totally meant to be there. Nice wheels will have to wait until after the Turbobricks meet...trying very hard to get the car ready for August 10. Yeah, I remembered seeing yours in there, and how nice it looked Dale!But once I actually helped put it in, and saw how similar it was to the original, it really felt like that seat was supposed to be there! Post subject: Interior Finished...I think. Here's the final photo's of the interior install. Greg and I got her all bolted in last night and were very pleased with the results. Here's the front seats installed after the leather treatment and dying. Dying the seats is not easy, but I'm happy with the results. I love the colour, but it is not quite the match I was looking for. Dale's 242 seats in new skins...looking good. 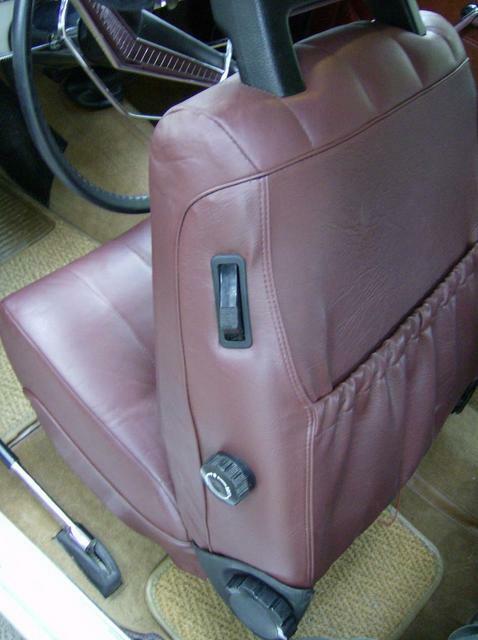 I've got heaters in both front seats and the funky fully adjustable 240 bases on both sides. Here's the rear seats. The back seat is attached to the original 122 metal bracket, which I recovered in black vinyl and tucked under my rear shelf. With the side trimmed it fits like a glove. I still would like the drivers seat an inch or so lower...something to fiddle with a little. Ya, in the light of day it is very spanky. I'm going to redo the drivers side mount to get it down an inch. Took the car into work today and I felt like I was riding a little high. More progress on the Canuck - getting ready for disk brakes in the rear. Sure beats getting your hands all slimey with orange goo. Last edited by 122_Canuck on Tue Oct 30, 2007 8:38 am, edited 1 time in total. You going to POR15 clearcoat that? Olaf rules. I love that guy. Which panels are you getting Dale? Craig's new B20 block is polished the same way. Purdy.